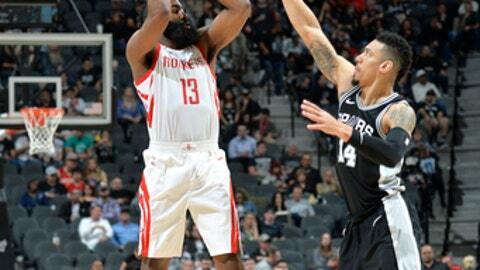 SAN ANTONIO (AP) The Houston Rockets used their offense to roll past San Antonio in December. This time, they shut down the Spurs with their defense. James Harden had 28 points and 11 assists, and Houston dominated San Antonio for the second time this season with a 102-91 victory Thursday night. Capela added 14 points and 13 rebounds in Houston’s third straight win. The Rockets led by as many as 19 points in the first matchup between the Texas rivals since the Spurs’ 124-109 blowout loss on Dec. 15 in Houston. The Spurs’ only lead came in the opening minutes. They trailed by double digits for much of the night. San Antonio scored the first points of the fourth quarter to close to 82-76 with 10 minutes remaining. But Chris Paul responded for Houston. The veteran point guard, who is nursing a sore right groin, apologized to coach Mike D’Antoni for being too cautious and allowing the Spurs to get back into the game. Paul hit three jumpers to rebuild Houston’s lead to 88-76. The Rockets finished 14 for 42 on 3-pointers. Danny Green had 22 points to lead San Antonio in scoring for the first time this season. LaMarcus Aldridge was held to 16 points on 8-for-15 shooting. Houston scored 27 points off 16 turnovers while San Antonio was only able to produce four points off nine turnovers. Gerald Green added 15 points for the Rockets, and Ryan Anderson had 13 points. Rockets: G Eric Gordon was listed as questionable, but did not play due to low back stiffness. … F Trevor Ariza missed his second straight game with a strained left hamstring. … Capela recorded his 25th double-double in 45 games this season. He had 25 double-doubles over 154 games in his first three seasons. Spurs: Kawhi Leonard remains out with what the Spurs call return from injury management due to right quadriceps tendinopathy. He was not in uniform for a second straight game after being dressed and sitting on the bench in the first two games of the five-game homestand. … Aldridge has led the Spurs in scoring in 39 of 50 games, the most of any player in the league this season. Rockets: Visit Cleveland on Saturday night. Spurs: Host Utah on Saturday night. San Antonio observed a moment of silence before the game to honor former Spurs player Rasual Butler. Butler and his wife, Leah LaBelle, were killed in a single-car crash early Wednesday. Paul and Tony Parker have had some memorable battles during their storied careers, but they weren’t on the court together often Thursday night now that the Spurs’ veteran is coming off the bench.